Nat did this from memory. 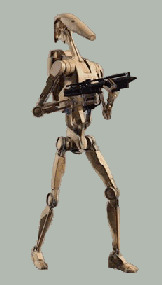 I had to pull up an image of a Battle Droid to appreciate what a great job he did. This is the kid who refused to color or draw in Kindergarten or preschool, so I'm glad he's making up for lost time! No kidding he made up for lost time. Seriously enter that into a fair or contest. When I read his bio. for school and it said, "I like to draw." I was thinking, "Since when?" The last I heard, he didn't like to make any marks on the paper. That is such an awesome drawing!! Go Nathan! wow... see graphic artist in his future!!! Wow I couldn't do that nice of a job with tracing paper. Interestingly when I googled my word verification letters, which are "snesests", the first match dealt with imaging galaxies. Coincidence? I am impressed and so glad that there are other budding artists in the family. I actually like the composition and the energy of the lines. Sometimes children are better at capturing energy and emotions than adults who start to second guess and doubt their skills. Good job Nathan!! !